French publisher Jean-Jacques Pauvert first came to my attention as the publisher of Hollywood Babylon, published by Pauvert in 1959. Over at my Tumblr microblog I’ve posted Jayne Mansfield’s décolleté on the cover of that book. Pauvert was also the first publisher of the works of Marquis de Sade, which had not been published for a long time. This led to an obscenity trial. Above is Nigel Finch‘s documentary based on Hollywood Babylon. Pauvert is in my canon. This entry was posted in Uncategorized and tagged Hollywood Babylon, Kenneth Anger, Pauvert on September 29, 2014 by jahsonic. I’ve put the two dicta above in my category Dicta at http://artandpopularculture.com/Dicta. I currently have 330 dicta. The first 330 of what will become an unranked top 1000. 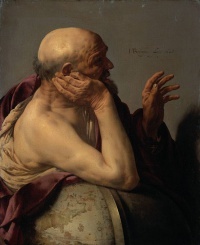 I spent some time trying to find out why Heraclitus is often depicted with a globe. Unsuccessfully. Anyone? This entry was posted in Uncategorized and tagged dicta, Heraclitus, philosophy on September 19, 2014 by jahsonic. I saw an early episode of the Big Bang Theory which mentioned Olds and Milner’s rats and how these rats would self-stimulate their pleasure center to the point of exhaustion. This led to my discovery of American psychiatrist Robert Galbraith Heath (1915 – 1999). In a documentary dedicated to the work of this man, “Brain Mechanisms of Pleasure and Addiction”, an unidentified woman who has undergone deep brain stimulation pushes her own pleasure button repeatedly. The experiment is considered unethical nowadays. If an estimated 10% of the Western world is on anti-depressants (“One in 10 Americans now takes an antidepressant medication; among women in their 40s and 50s, the figure is one in four.”nytimes), why is deep brain stimulation with a “pleasure button” considered unethical? Deep brain stimulation is used with astonishing results in patients suffering from Obsessive–compulsive disorder. Maybe one day we will all have an orgasmatron in our brains? Would it prove to be so addictive that we would die in great numbers from starvation and fatigue just as Olds and Milner’s rats and Korean video game addict Lee Seung Seop, who died in 2006 after playing for more than fifty hours straight. Or would there be more cases as the one of Kim Sa-rang, a 3-month-old Korean child, who would die in 2009 from malnutrition after both her parents spent hours each day in an internet cafe raising a virtual child in an online game. I used to believe in the complete sovereignty of one’s own body. And then there’s the tragic story of patient B-19. This entry was posted in Uncategorized and tagged addiction, deep brain stimulation, depression, neurology, psychiatry on September 10, 2014 by jahsonic. The Way Things Go by Peter Fischli & David Weiss is World Art Classic #463. Peter Fischli & David Weiss’s work is unclassifiable. Which is a good thing. Yet despite this quality of being genre-defying, their work is defined by playfulness and humor absent from 90% of contemporary art. I rather enjoy wit and humor in art. The absence thereof, seriousness, is, in my view, one of the faultlines in 20th century art. Modernism, for example, was reigned by a detrimental “cult of seriousness”. I first realized my predilection for humor in art somewhere around 2006, when I saw the painting ‘Man weeping, his tears form a waterfall‘. The humor of Peter Fischli & David Weiss reminds me obliquely of that of The Chapman Brothers, minus the Chapman’s fondness for painfullness. I’ve recently canonized Fischli and Weiss. As I said in the title of this post, The Way Things Go is ‘World Art Classic’ #463. Its alphabetical neighbors are The Unswept Floor, a second century AD mosaic and The Witch by Salvator Rosa. This entry was posted in Uncategorized and tagged art, humor, Peter Fischli & David Weiss, wit, world art classics on September 6, 2014 by jahsonic. Near Death Experience is a 2014 French film directed, produced and written by Benoît Delépine and Gustave de Kervern coming to local screens from September onwards. The film stars French writer Michel Houellebecq as Paul, a burn-out man who escapes to the mountains on his racing bike with the plan to commit suicide. Some of Houellebecq’s work has already been filmed. Several years ago I saw the decidedly philosophical film Extension du domaine de la lutte (also known as Whatever) which is now on YouTube in its entirety. The “our hero” of Whatever reminds me of Paul. Houellebecq’s debut as protagonist has been acclaimed. He is part of my canon. This entry was posted in Uncategorized and tagged film, France, Michel Houellebecq, philosophical film, philosophy on September 4, 2014 by jahsonic.